India’s Ministry of New and Renewable Energy (MNRE) began the Aditya Solar Shops program in 1995 to support entrepreneurs who opened shops to sell subsidized solar-powered technologies. Shops were designed to sell items which would help poorer households without electricity access (or unreliable access) to tap into distributed solar power. Although most urban households in India tend to be connected to the grid—even if service is poor—many rural areas lie well beyond the reach of power plants and the central grid. This creates space for viable alternatives, such as distributed solar-powered systems and technologies. In 2010, the Indian government re-branded the Aditya program as the Akshay Urja Solar Shops program and expanded its reach to set up at least one shop in every district in the country. This was a signal from the government that India was serious about providing electricity access to its less centralized populations and that it intended to promote clean growth. This became blaringly clear in 2015 when the government declared it would provide reliable access to every household in the country by the next national election in 2019; that’s quite a promise considering nearly a quarter of the country’s 1.3 billion people still live beyond the reach of the grid and without any modern alternatives. Riding the wave of solar’s momentum in India, the Akshay Urja program was folded into the government’s wildly ambitious National Solar Mission (part of the National Action Plan on Climate Change) to install 100 gigawatts of solar in India by 2022. There are now over 400 subsidized shops operating, with some districts containing multiple shops to meet demand and other districts operating just one shop as part of the program’s loosely mandated floor (i.e., at least one shop per district). Akshay Urja shops receive partial government support in the form of subsidized soft loans, recurring grants, and turnover incentives for the first two years of operations. In addition to individuals, NGOs, state nodal agencies (SNAs), and manufacturers’ associations can also access financial support to open and operate solar shops. The open incentive structure of the program ensures more manageable startup costs and helps shops pass on slightly lower costs to consumers. We take a first stab at evaluating the Akshay Urja program by presenting the results from interviews conducted among shop owners. Overall, a handful of shops within a few districts reported strikingly high sales figures, while a majority of shops reported much more modest sales. We discuss our initial results at both the state and district levels in the following sections. 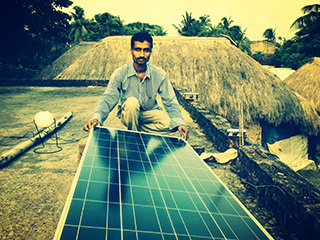 As of 2012, there were 284 solar shops (both Aditya and Akshay Urja) operating throughout India. Of these, 176 shops—located throughout 163 districts—were sampled to be interviewed when data was collected in 2014. Of the 176, a total of 81 shop owners (about 30 percent of the total population of shops) participated in the survey. Shop owners were called at least three times to attempt to administer an interview. The questionnaire included a simple set of questions, asking owners to report their sales of four major products in the previous year (2013-2014). Technologies included 1) solar home systems, 2) solar street lights, 3) solar lanterns, and 4) solar hot water heaters. An overview of the results at the state level is included in Figure 1 below. We discuss the results in more detail at the district level in the following section. *All figures are authors' production. Shop owners were asked to report their estimated sales of four major solar products during the year 2013-2014. Each of the four graphs represents annual sales of each product aggregated at the state level. Two states, Haryana and Uttar Pradesh (UP), were home to shops reporting relatively high sales of almost all products. 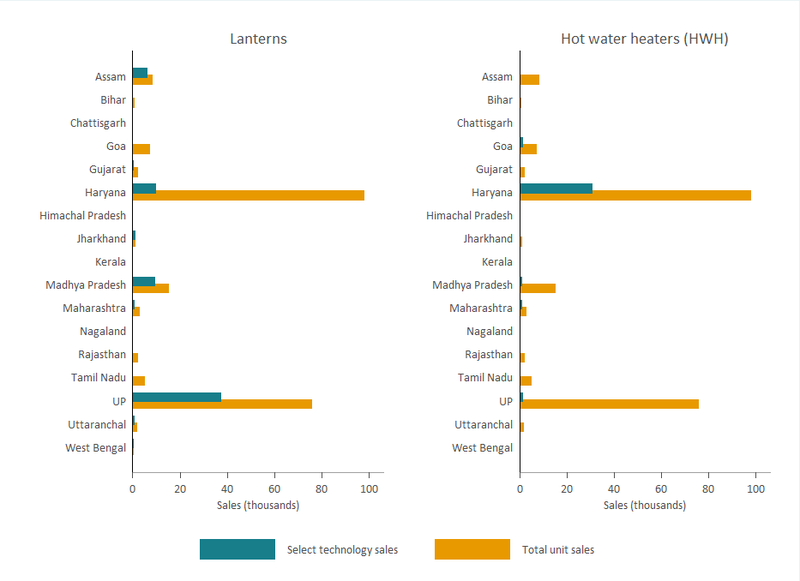 Madhya Pradesh and Assam also exhibit relatively high sales for solar lanterns. States without any participating shops are not included in the figure above; those states are: Andhra Pradesh, Chandigarh, Jammu and Kashmir, Karnataka, Manipur, Mizoram, Odhisha, and Puducheery. In each of the subsections below, we discuss each of the four products and reported sales results at the district level. Sales are reported predominantly by one shop per district. There are some districts with more than one shop, but these additional shops do not add any sales to the aggregated total at the district level. We highlight the top 10 sales districts in tables to the right of each subsection map. Lanterns ensure a basic amount of light and are often considered a first rung on the energy access ladder. Solar-powered, as opposed to kerosene, lanterns offer co-benefits of reduced carbon (and black carbon) pollution and long-term health benefits. According to a recent study conducted by Muyanja et al. (2017) in rural Uganda, only 27.6 percent of sampled households with kerosene lanterns met the World Health Organization’s (WHO) safe indoor air quality standards. 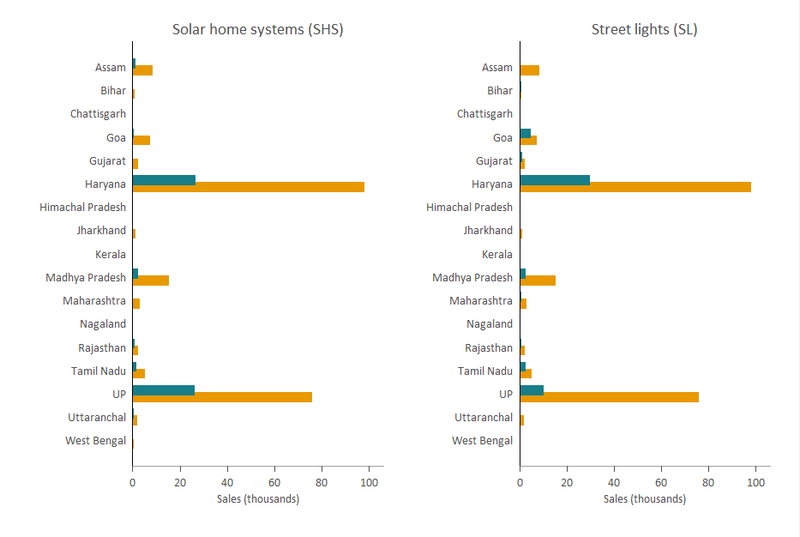 Conversely, 75 percent of sampled households with solar lanterns met the WHO’s standard. In the map below, we see that many Akshay Urja shops (which are represented in aggregate at the district level) reported modest solar lantern sales, while select and seemingly random districts exhibited higher sales. The darkest district on the map, Agra (located in the northern, central region), is an extreme outlier with self-reported annual sales of 35,000 lanterns. All other shops reported under 4,000 lanterns sold annually. This may be the result of falsely reported sales figures or incredibly high uptake of lanterns in Agra for distribution throughout the country (though the latter seems unlikely). The top ten sales figures by district are shown in the table to the right. Of all the individual technologies sold by the Akshay Urja shops, solar home systems (SHS) are capable of providing the most power to a household. The problem with SHSs is the upfront cost. As part of a growing pay-as-you-go (PAYG) finance model in India, many companies allow customers to pay a small upfront fee and subsequent monthly payments to eventually own a SHS. This type of finance model makes SHSs more affordable, particularly for poorer rural customers. The model does, however, require there to be an established mobile money transaction system, which may not exist in more isolated areas. As we see below, shops in Hisar and Agra districts have claimed notably high sales of 25,000 and 20,000 units, respectively; the majority of districts contain shops reporting aggregated sales of less than 1,000 units per annum. Again, the top ten sales figures by district are shown in the table to the right of the map. The diagram in Figure 4 depicts the flow of a simple SHS and its features. 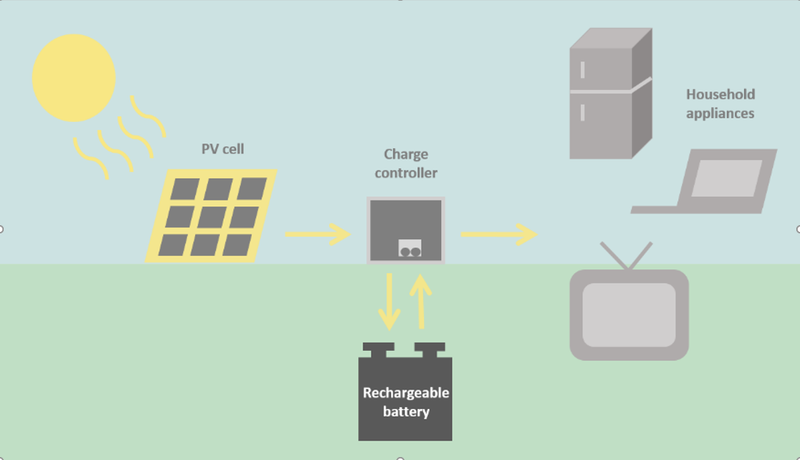 Solar radiation reaches mounted panels, which convert light energy to electric energy that is sent through a charge controller. From here, energy is either stored in a battery (if available), used by household appliances, or lost as heat energy. Street lighting is important for several reasons. Low-carbon street lighting can help curb greenhouse gas emissions from lighting, but street lighting is also a very important safety feature of a community. Street lighting allows people to safely commute to and from work or school, allows women to walk at night without fear (or less fear) of sexual harassment, and generally helps to deter crime. The national government aims to replace all existing street lights with solar-powered LED lights within the next decade, and this will require successful market penetration of solar street lighting technology throughout the country. As we can see in the map below and among the top 10 districts of aggregated shop sales, there has been measurable uptake of solar street lights consistent with other major technologies. Hisar and Agra, along with Yamuna Nagar, report remarkably high sales figures compared to other districts. Hot water is central to bathing, laundry, and cleaning. However, it’s energy-intensive to heat water. Even for households connected to the grid, using the energy required for heating water for bathing and cleaning is not always practical. The map below shows areas of weak to strong market penetration for solar HWHs. Again, Hisar reports vastly higher sales figures of 30,000 units compared to other districts, which mostly report sales under just 1,000 units per annum. Shop owners were asked supplementary questions during follow-up interviews about their keys to success or failure. 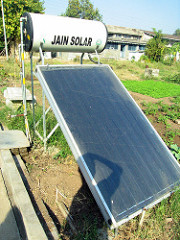 In sum, although the Akshay Urja program did establish a network of solar product distribution centers around the country, many shops have struggled to connect their products to large markets of consumers for a few major reasons: upfront costs remain burdensome, maintenance problems aren’t addressed, and competition with a rapidly expanding electric grid is increasing. Despite a basic level of incentives which help to keep the upfront costs lower than market rate, most products are still too expensive for low-income, rural markets. Shop owners also reported very few maintenance requests, though it’s likely that many of these technologies—except for possibly solar lanterns—require regular inspections and repairs. A possible explanation for this is that shops don’t offer any in-home maintenance services and are located in district headquarters, which tend to be far from their remote customers. Finally, as the electric grid expands more rapidly into rural areas, consumers appear to prefer grid connections, at least initially. However, considering the sporadic service delivery from the central grid, many consumers may draw electricity from a diverse set of options. The continuation of the Akshay Urja program may depend on further business innovations in how the entrepreneurs choose to sell their products against the backdrop of an increasingly competitive grid and the benefit of decreasing costs of various solar technologies. Central and state governments could revise the currently capped incentive structures for conducting sales along the lines of the successful franchisee model of Bangalore-based private firm Orb Energy. Finally, the government’s Surya Mitra program which seeks to train an army of solar engineers could be paired with Akshay Urja shop owners to improve quality assurance of products and after-sales support.